I am a fine artist who utilizes the innovation of digital tools to plan create and change the thinking process, expanding the vision of what is possible. I then use traditional fine art and scenic artisan skills that I have learned through my education and training with theatrical productions and films. I have studied with teachers who follow the United Scenic Artists Local 829, traditions, which began in 1897. Today the United Scenic Artists are affiliated with the International Alliance of Theatrical Stage Employees (IATSE). The teachings of this tradition are over a hundred years old. The painting skills I learned have brought me all over the country. I have worked for Opera, Theatre, and film productions. I have grown to love passing along my skills to students and have taught in high schools and universities. 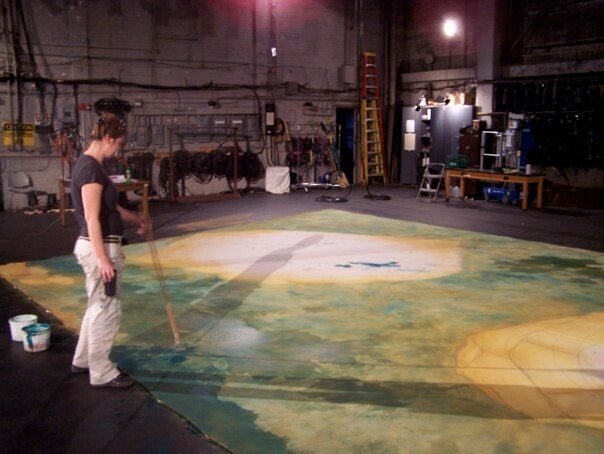 "I wanted a more collaborative experience and was attracted to the malleability, artistry and technical expertise required to be a professional scenic artist"
Cara holds a MFA in Scenic Design for Theatre, Television and Film from San Diego State University. And a BFA in Painting Fine Arts from San Francisco Art Institute.